The days of running applications or programs from your own server is fast becoming a thing of the past. Businesses are now turning towards cloud computing. You may have heard the term being bandied about the office recently. But what is it? 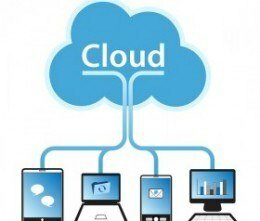 Cloud computers allows people to run applications and programs through the internet. Its popularity has grown expediently over the past few years with small to large organisations worldwide spending billions of dollars on it. So why are business moving towards cloud computing? That’s what we’re here to find out. Moving to cloud computing has a number of cost effective benefits. Firstly, you will reduce expenditure on hardware, software or licencing fees, because that is generally included in your contract. Secondly, it may reduce the cost of managing and maintaining your IT systems. Many cloud computing companies will provide automatic software update as part of their service. These include updates to software (e.g. security software, which is very important) and server maintenance. IT departments spends a large chunk of their time on tasks such as these. By outsourcing it, it frees up their time, so they can devote it elsewhere. You may also find that you don’t need to employ as many staff to run your IT department – this is especially advantageous if you’re a small business. When you use a cloud based service, it gives you flexibility to scale up or down your operations and storage requirements very quickly. This ability to quickly respond to the changing needs of your business not only frees resources that would have otherwise been dedicated to the task, but makes you much more competitive because you are so adaptable. When your store your data and systems on the cloud it protects it from being lost by an unforeseen event (e.g a natural disaster or a power failure). Because it is stored and protected in multiple secure locations, you are able to access it quickly after an incident, which allows you to get back to business much faster. This reduces downtime and the loss of productivity. In our world of globalisation, we work with individuals from different time zones and countries. Cloud computing makes it easier to work with these people, because it allows us to communicate and share documents with them much more easily. Cloud computing keeps all your files in a centralised location. This ensures that everyone is working off the same file, which is more efficient than traditional methods. With cloud computing, employees can work from anywhere as long as they have internet access. This is great for people who spend a fair portion of their work day ‘out of the office’ and need to jump online to check a few work files. It also gives employees the flexibility to work from home, an option that positively affects happiness and productivity. Should you get cloud computing? In this blog, we have explored the many benefits of cloud computing. Whether you should get it for your business depends entirely on your business needs. If, after reading this, you are still unsure whether it’s right for you, why don’t you contact us to discuss cloud services?